Signatureless anti-exploit, anti-ransomware, and root cause analysis protect your endpoints from advanced threats. Learn more about Sophos Intercept X. 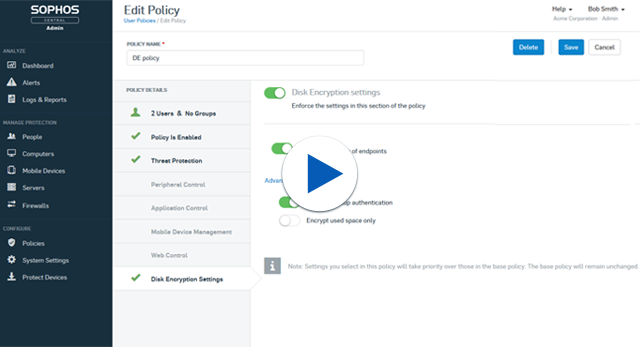 Advanced endpoint protection coupled with a simple, intuitive user experience. Learn more about our Endpoint Protection. Enterprise-grade Secure Web Protection that’s advanced yet easy to use. Learn more about our web protection. 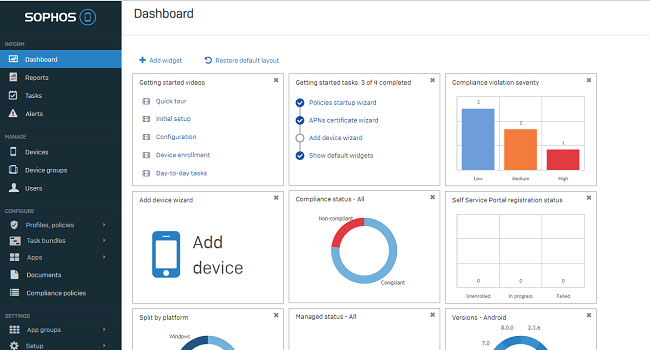 Sophos Mobile is the comprehensive Enterprise Mobility Management solution that lets you spend less time and effort managing and securing mobile devices. Learn more about Sophos Mobile. Protect your virtual and physical servers without sacrificing performance, including one-click Server Lockdown. Learn more about our Server Protection. A simple, effective way to manage and secure your wireless networks. Protect your data in the case of lost or stolen computers. Device Encryption is the easiest way to centrally manage Windows BitLocker or macOS FileVault full disk encryption. Learn more about our Encryption. 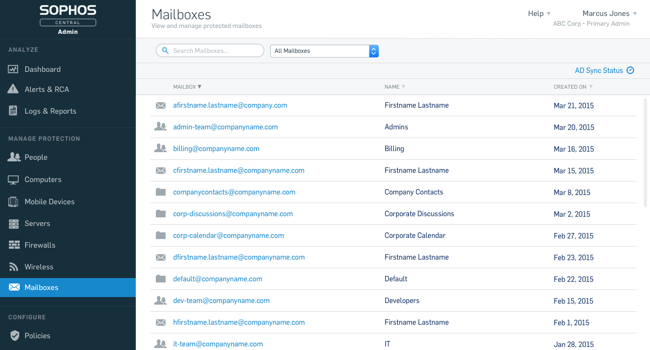 Protect and manage email in the cloud and simply stop spam, phishing, malware and data loss. Learn more about Sophos Email. Comprehensive next-generation firewall protection that blocks unknown threats, automatically responds to incidents, and exposes hidden risks on your network. Sophos Central allows you to manage our award-winning Synchronized Security platform. Advanced attacks are more coordinated than ever before. Now, your defenses are too. Our revolutionary Security Heartbeat™ ensures your endpoint protection and firewall are talking to each other. It’s a simple yet effective idea that means you get better protection against advanced threats and spend less time responding to incidents. It’s so simple, it makes you wonder why nobody did it before. 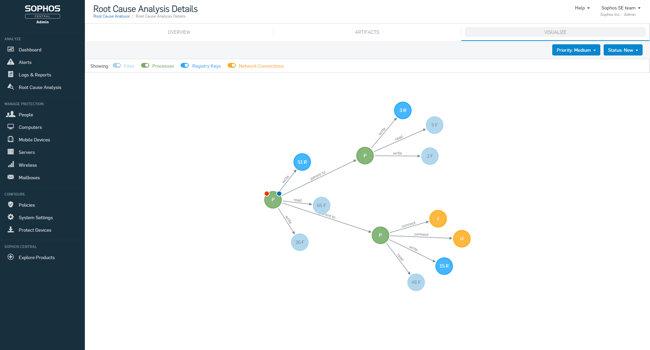 Advanced threat indicators like suspicious network traffic are instantly shared between the Next-Gen Firewall and the Next-Gen Endpoint to detect and prevent attacks. Active identification of compromised systems shares computer names, users, and paths between your Endpoint and Firewall, so you can take action quickly. Compromised endpoints are automatically isolated by the firewall, while the endpoint terminates and removes malicious software. And, it saves IT time and money through automated incident response. Sophos Central lets partners manage multiple customer installations from a single, intuitive interface. Respond to alerts, manage licenses, and track upcoming renewal dates. Users can log in to the self-service portal to customize their security status, recover their password, and get notifications. 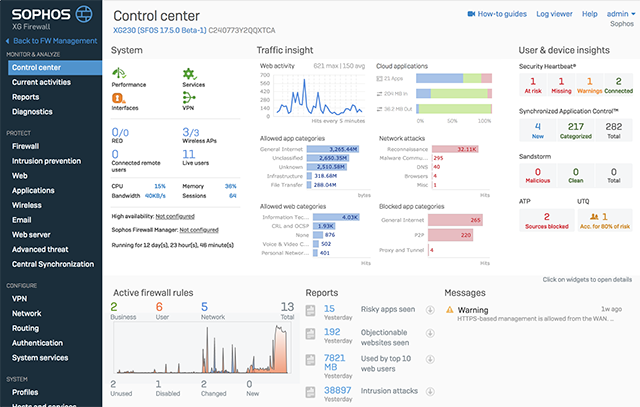 Try Sophos Central free for 30 days.